During a Florida divorce, it is not only marital assets that must be divided, but also any marital debts, as debts are considered property for the purposes of asset division. This means that in addition to deciding who receives the marital home or automobile, obligations such as credit card debt must also be apportioned. This can be somewhat confusing, especially if one factors in titles and ownership habits of certain assets or debts themselves. Like with marital assets, marital liabilities are divided as close to equitably as possible. Florida law characterizes a marital liability as a debt or obligation incurred during the marriage that is totally or partially paid back with marital funds. If it is uncertain whether a debt is marital in nature, behavior patterns and titles can also make a difference. For example, a mortgage on the marital home will likely be deemed to be a marital debt, even if it is taken out in only the husband’s name, because both spouses use the asset and (at least in theory), funds from both spouses go toward paying off the balance of the debt. While in many divorces, division of debts can be very straightforward, it is important to keep in mind that complex situations will require more planning and more questions to be asked. In some cases, the right balance between assets and debts can be very delicate, especially when there are children involved. A common example of this is when the marital home is “underwater” (that is, more is owed on the balance than the existing value or equity of the home) – who pays what? Is the home still considered an asset, especially if there are children of the marriage who would react poorly to moving? Bankruptcy may also be a concern, depending on the financial status of your soon-to-be ex-spouse. 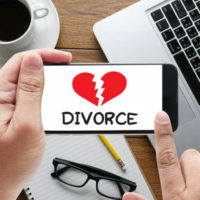 Divorce decrees are not binding on a couple’s creditors, which means that both spouses may still be reachable for the balance of certain debts even if the divorce court assigns the responsibility for the debt to one or the other. Sometimes, this leads spouses to file for bankruptcy to avoid their part in paying debts like credit card balances or car payments. Whether they are able to do this depends on the hardship to you (the paying spouse), and on the type of bankruptcy they may try to file – many debts are dischargeable under Chapter 7 bankruptcies, but not under Chapter 13, for instance. Because asset division can be quite complex and confusing, having a knowledgeable attorney on your side in your divorce should be one of the first steps you take before proceedings begin. The Hollywood, FL divorce lawyers at the Law Offices of Steven A. Mason, P.A. handle these cases often, and are happy to sit down with you and try to help you distinguish how best to handle yours. Contact the Fort Lauderdale and Hollywood Law Offices of Steven A. Mason, P.A. for legal advice at 954-963-5900 or leave a message online.